We have an amazing group of women who hand-assemble all of our dividers. The friction of the divider during the assembling process damages their clothes however, which led to the ladies’ suggestion to get aprons to protect their clothing. Here the ladies are donning their brand new aprons. 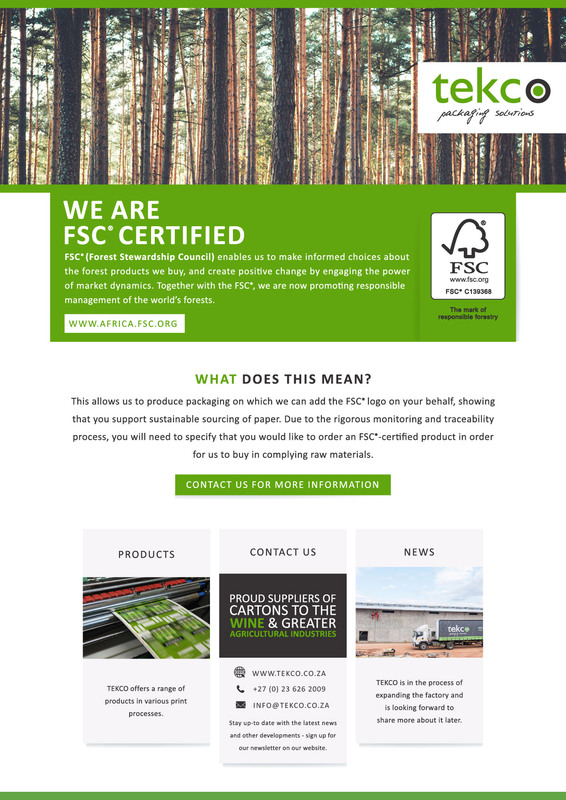 FSC (Forest Stewardship Council) enables us to make informed choices about the forest products we buy, and create positive change by engaging the power of market dynamics. Together with the FSC, we are now promoting responsible management of the world’s forests. At TEKCO we pride ourselves in offering you the best packaging solutions. And sometimes, that solution will be our stock cartons and dividers. Whether you want cost effective packaging for your entire range of wines or you just need some cartons to top up your current packaging, our stock cartons is the answer. And don’t forget your dividers! With a generic range to suit most bottle numbers, available in solid board or corrugated, we are bound to be able to assist. This month, we would like to introduce you to this range, but also remind you that the end of the year is approaching fast! So please keep in mind that for all deliveries required by 15 December, orders should reach us by no later than 4 November. Deliveries for the new year will commence on 11 January. To ensure that you have enough stock during this peak period, we advise that you order enough cartons to cover your needs until the end of January 2017. As mentioned, our stock cartons, which is available in kraft and for 6x750ml bottles, can be used for your entire range, or in case of a shortage on your branded cartons. The sizes of the cartons are developed to suit a variety of bottle numbers (to use together with solid board dividers), especially the popular bottles of Consol and Nampak. The aesthetic design of the cartons ensures a striking palletised look and with delivery available within 2-5 business days, we hope this will keep your stress levels low when you run low on packaging! TEKCO manufactures a range of dividers for 6x750ml and 12x750ml bottles through a die-cutting process, which eliminates waste particles, both in solid and corrugated board. As with the stock cartons, our range is suitable for a variety of bottle numbers which means that you won’t have to buy bits and pieces for each of your ranges, but rather in larger quantities to get the advantage of economies of scale. The choice of difference in height further accommodates different bottle shapes. We can deliver dividers in 3-6 business days, but we do request that for bigger orders, or constant orders every month, that you contact us in order to take this into account when determining our stock levels to assist us to keep to these lead times. As for minimum order quantities on both the stock cartons and dividers, we prefer to process orders in quantities of full pallets. This simplifies our logistics and ensure that we can keep our products cost effective. Quantities on each of these products differ, so please contact your sales representative or our office for more detail. 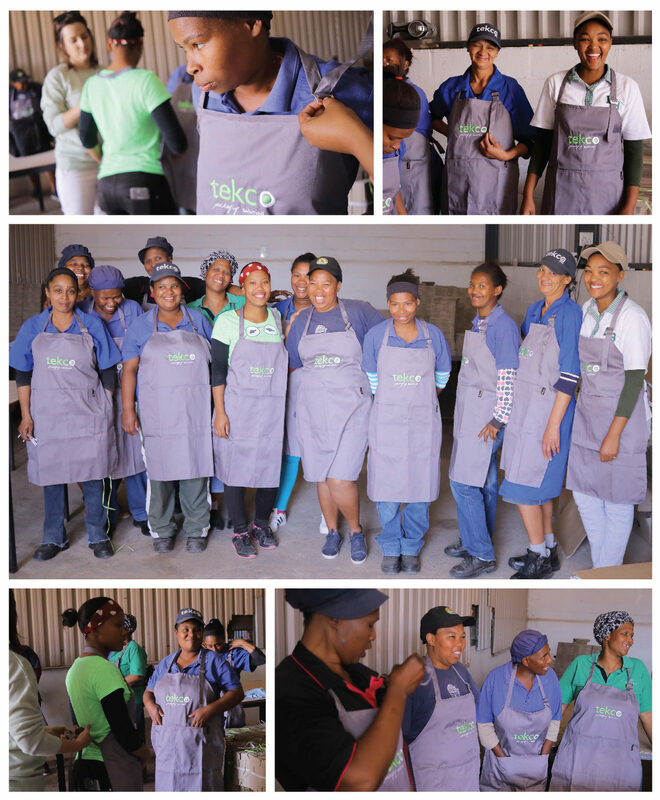 On 9, 16 and 23 September 2016 the Breede River Hospice visited TEKCO’s factory to host an information session on the topics of HIV, TB and Diabetes. In addition to that, a medical file was opened for each TEKCO employee and their blood pressure, sugar level, cholesterol and TB-status was tested free of charge. Employees also had the opportunity to do an HIV test if they wanted to. On the photo, Benjamin Pieterse’s blood pressure is measured by a friendly Hospice staff member. Our sincere thanks to Breede River Hospice for their wonderful service.